← Cessna’s Chinese adventure a failure. Corvair Oil System, information on oil pressure gauges. A friend of ours who is building a Zenith 750 wrote in with a quick note asking about oil pressure gauges and senders. 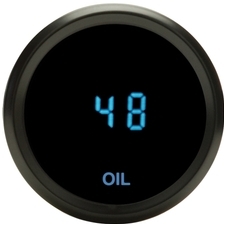 I pulled together this general set of notes on oil pressure measurement and instruments as a good resource on the general subject. Over the years Corvairs have flown with just about every kind of oil pressure instrumentation imaginable. Going back to my point of Principle vs Preference. On this subject, it mostly falls in the category of preference. The Builders specific question was focused on sending units for electrical gauges, and their reliability. If I had to pick one brand over another, I will say that I have never had an issue with the senders that are used in Autometer gauges. VDO is usually trouble free, but I have personally had one mess up, and it caused a lot of work with it’s erroneous information. Goes without saying, I wouldn’t use one from the land of Chairman Mao. 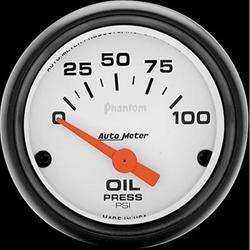 Some people are concerned about mechanical gauges bringing oil into the cockpit, but in actual experience, I have never had an issue with it. The line itself is 1/8″ on the outside, but only 1/16″ on the inside, and I generally put a #80 hole in a restrictor, at the engine, so even if the line came off, the flow rate is about 1/2 gallon per hour. For the record, I have never seen even the poorest mechanical line installations leak. You can take the nut off at the gauge with the motor running, and it does not “spray” oil, it just oozes, and even when the engine is hot, the oil really isn’t after six feet of line. Below is the close up of the mechanical oil pressure gauge I have in the Wagabond. In addition to all the other things I like about mechanical gauges, I like the fact the needle covers a 300 degree arc, allowing you to see very fine changes. 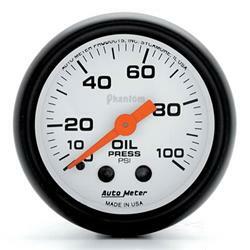 The gauge below is $54.97 from summit racing. For Builders interested in digital instrumentation, Google the name “Dakota Digital”. Below is one of their instruments, but the come in many different varieties, all made in the USA. They have a website you can buy direct from, it has many choices. Just a reminder, never mention to anyone on the phone while ordering from a non aviation company that you are building a plane. Summit will actually black list you. The people answering the phone have $9/hr. jobs, so don’t jeopardize anyone’s just scraping by living by saying that on the phone, and having them get in hot water for not turning you in. It is an annoying fact of a litigious society, but you are not going to fix it by getting a single mother just above the poverty line fired. The story below has comments on oil pressure errors in electronic instrumentation. That part is 2/3rds of the way down at the picture of the Corvair/701. Thoughts on cold weather operation, minimum oil temps, etc. Notes on Corvair flight engine oils. One Response to Corvair Oil System, information on oil pressure gauges. I would like to add something to your instruments comments. At an early point in my life I spent some time driving truck to help put myself through school. If you’ve ever driven a big diesel truck, you know that it has a large instrument panel–larger than many GA airplanes. Truck drivers call them gauges, pilots call them instruments. Because there are so many instruments, it can take a long time to study each one to make sure the needle is in the safe zone for that important engine parameter. This should not be a time consuming activity either for a truck driver or an airplane pilot. You want this to be a small part of your workload because you want your eyes on other import things. If the instruments are all over the place and point in several different directions, it takes too long to look at them all and hence some of them will be ignored. This can be very dangerous. To make the instrument scan simple and short, well laid out instrument panels orient instruments in a row or a column or a cluster and use instruments that all have the needle pointing in the same direction when that instrument has a normal reading. This enables the driver (pilot in our case) to do a rapid sweep of the instruments without much analysis and can tell at a single glance if anything is out of whack because one of the needles will be pointing in a different direction than all the rest. Then, this one instrument can be focused on to determine the problem. So, as the instrument panel is laid out, and the instruments purchased, if the builder plans for the instruments to be in a row, a column or a cluster, and purchases instruments with the needle all pointing the same direction when in the normal range, the pilot instrument scan can be very quick, and any anomaly will be instantly noticed. If one or two instruments don’t point the same, the instrument can be rotated in the panel until it does, even if it isn’t right side up. This is also a very good reason to use analog instruments rather than digital instruments (needle rather than a numeric display). Typically, quality instrument manufacturers like Autometer make individual instruments (gauges) in matching families or matching sets. The faces are all the same color and look good together. But more importantly, the needles all point the same way. So, even if the cost is a little more than mixing and matching, the safety factor built into this type of matching instruments is worth the extra expense.